Have y’all heard the news? Food Labels are getting a makeover for the first time in 20 years! It’ll feature things such as more prominent calorie counts and more realistic serving sizes. That means that the protein shake you quickly grab, thinking you’re being good and choosing something healthy, will more than likely only have 1 serving in it, instead of the common 2.5. Here’s a big example of what they’re trying to change. Currently, if you were to buy a 20 ounce bottle of Mountain Dew at the gas station it’s listed as having 100 calories, but that’s per serving…and each bottle has 2.5 servings. Who honestly would only drink their one serving, put the lid on and be done? By the time you go back it’s flat and gross. They’re saying that a serving of ice cream will no longer be listed at 1/2 a cup, but actually 1 cup. People are probably going to start actually thinking about the choices they’re making if they’re faced with realistic portions. It’s easy to pick up a bottle of soda and see “70 calories” and read no more, but when picking up a bottle and seeing “210” people might be more inclined the stop. When that chip bag says 7 chips for 140 calories – HA! *HA! * They should put the calories for the whole damn bag and make that one serving. I’m sure most of us are hoping they go with option 2 – which likely means it won’t happen. Because it’d be logical. They’re saying this will probably take at least a year to do. It effects marketing, pricing, etc. The United Kingdom already does this with a front-of-pack label that uses a color coded system so you know the amount of calories, fat, saturated fat, sugars and salt. Red = bad. Green = good. Yellow’s = could be better. I don’t know, maybe I’m a nerd. I’m pumped about this. It’s all about knowledge, and knowledge provides power, and power leads to change. I love the UKs version. It’s simple and dumb guy’d down so you have no excuses. I’m thrilled that they are changing the labels here. It’s about damn time! I like the idea of making the serving size more prominent on the package. It is really easy to think that a small bag of chips is a serving when it is 3, or that a serving of oreos is one whole row (it is, isn’t it?!). Having more realistic serving sizes is also helpful. Have you ever eaten 1/2 of ice cream? It is puny. That is the amount I put between the aforementioned oreos, not as a standalone dessert! Our labels in Canada are very similar to yours in the US so I hope that we will also see some positive changes. Just this last week the provincial government passed a bill saying all chain restaurants have to post calorie counts on the menus. Part of me thinks that it is treating people like they are dumb and if you care about that stuff you’ll know anyway what is a good or bad choice but the other part of me remembers how SHOCKED I was when I was in New York City and saw calorie counts for things that I knew were bad but didn’t think were “a day and a half of calories” bad. So maybe if it helps one or 2 people make better choices per day then it will be worth it. Yeah – a lot of the places here have calorie counts and since you are served a portion of it, it’s easier to control. I look forward to grocery shopping with realistic portions! Haha! Yeah, I think it’ll be great. I like the proposed changes – either of them seems better than your current version. The UK traffic lights system is quite helpful, although as it’s not mandatory, it’s not on everything. (There’s also usually more detailed info on the back of packets). I agree that it’s not always obvious what a serving size should be (and can admit to having ‘accidentally’ eaten a “sharing” bag of crisps) – I wish that manufacturers would stop super-sizing things and create smaller, healthier versions… but I can imagine that they would probably keep the price the same. Very few restaurants in the UK display calorie counts, which I noticed on menus when I was holidaying in the US. It’s becoming more common here, but mainly in large US chains (such as Subway and Starbucks), and it’s not prominent. When I’m being good with Weight Watchers and I have to eat out, I try to look up the nutritional info in advance, but it’s often buried in the depths of websites! I LOVE that they are proposing a change that actually makes sense. I like option 2 because it’s more educational. Not everyone knows about those things and it’s just easier that way. I also love the serving size change. 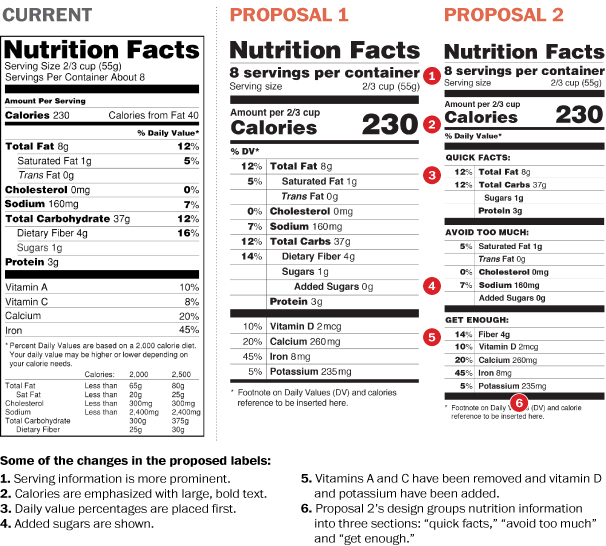 I like the idea of the changes, particularly showing added sugar which I understand the food companies are opposing. Truthfully, though, I like Proposal 1 much better than Proposal 2. I find it too tedious in Proposal 2 to pick through it to find the information that I’m most interested in. I don’t want to have to look in one place to see total fat and another place to see sat fat or trans fat. Likewise, I want to see fiber up there with fat, carbs, and proteins (I do count calories but I also calculate WW points). So – for me – Proposal 1 is easier to read. But, both of them are better than the current version. I can see some issues with option two…I am sure some companies will argue whether something qualifies as “Avoid too much” versus “Get enough of.” I also want to point out that this isn’t going to change the fact that the labels are by law allowed to be as much as 20% incorrect. Just, don’t think because the labels are CLEARER that they are any more ACCURATE. But at the end of the day, this will lead to better education on food choices, which is our ultimate weapon to fight unhealthy bodies. I can’t wait! Good call on the 20% – perhaps that’ll change with the makeover too. I totally agree about the fiber. In fact, it really annoys me that on MyFitnessPal I can’t see my fiber intake readily. Yeah, the serving size one is huge for a volume person like me. Yeah, I keep hearing that the US is unique regarding how we post the calories at restaurants. I wish all places had to list it on the menu. I think it would force people to reevaluate their relationship with food – good and bad.